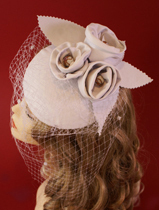 Type: "Caro Wedding cream coloured"
Extraordinary sinamay headpiece in creme with a big bow , lots of veiling, selected coquetips and a small pearly shell fixed in the middle of the bow. Caro is fixed on the hair with a comb. 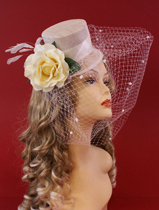 White mini tophat garnished with a silk band, large fabric rose in creme, a lot of white veiling with chenille dots and white coquetips. This hat has a fine black rubber band to fix it around the head. Length: 21 cm, width: 18 cm, height: 10 cm. 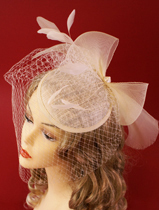 Big and eyecatching feather flower attached on a small sinamay base, sourrounded by white veiling. 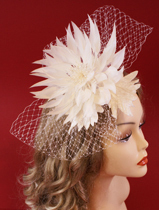 This gorgous Feather Flower is fixed on the hair with a comb. Leatherette is a very exclusive headpiece: three handmade flowers with white and gold glass pearls in the center, three handcut leaves and a lot of white veiling with chenilledots, attached on the leather covered base. Leatherette is fixed on the hair with a comb.